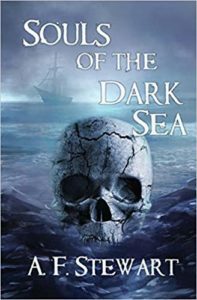 A. F. Stewart‘s latest pirate fantasy release is finally here! Magic, death personified, and an imbalanced universe are just a few of the things that make Renegades of the Lost Sea uniquely imaginative and a read you’ll remember. A god, his mother, and a Nightmare Crow. Old enemies surface once again and undead pirates roam the seas. The man he killed, Black Axe Morgan, has returned for revenge on Captain Rafe Morrow, while from the shadows the Nightmare Crow reveals his true self. The two form an alliance and bring mayhem to the seas, all to draw out Captain Morrow and his crew. Yet, this time, Rafe doesn’t face his enemies alone. 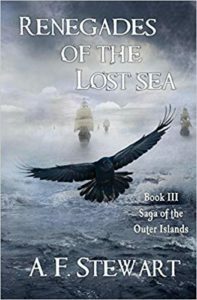 Death walks the Outer Islands to save her son and the Sovereign of the Gods leads Captain Morrow past all the lies to the truth. The fate of Chaos and Harmony itself hangs in the balance of this fight. Will centuries of schemes and plans reforge the bond of the realms, or will the Seven Kingdoms and the Outer Islands fall? Can the God of Souls find his destiny before it is too late? 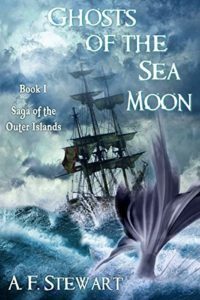 This entry was posted in Book Launches and tagged a. f. stewart, death personality, death personified, death perspective, epic fantasy pirates, pirate fantasy novels, pirate fantasy series, pirate magic items, pirate magic system, pirate novels, renegades of the lost sea, saga of the outer islands. Bookmark the permalink.